While Myrtle Beach may be known as a shopping, dining, and golfing destination, visitors can also enjoy plenty of live music when vacationing along the Grand Strand. Whether you're interested in showing off your singing chops at a karaoke bar, busting a move to the latest hits, or discovering a new favorite band, you'll find it all at the live music venues of Myrtle Beach. This one-of-a-kind live music venue at Broadway at the Beach promises guests a totally unique experience every time they visit! The dueling pianists at Crocodile Rocks are always ready to perform the audience's requests, from songs of the 1950s all the way to current top 40. They guarantee that there is a 99.9% chance their talented pianists will know the song you request, so if you're looking for live music with lots of audience interaction, then check out Crocodile Rocks at Broadway at the Beach! Party New Orleans style whenever you visit Bourbon Street Bar and Grill in Myrtle Beach, where you can expect live music every night of the week. The venue offers plenty of daily specials and events, including half-off burgers on Mondays, acoustic open jam nights, taco Tuesday, and more! Happy Hour starts at 4, but stick around until later for great performances by local acts. This upscale bar and grill is the perfect place to lounge and mingle to the backdrop of live music whenever you spend your next beach vacation along the Grand Strand. The Bowery is a seaside bar and grill located in the heart of Myrtle Beach, on the Boardwalk near the Burroughs and Chapin Pavilion grounds. Since 1944, this establishment has served up cold drinks and live entertainment to millions of Myrtle Beach visitors. Best for country music fans, The Bowery saw the rise of award-winning band, Alabama, whose hit-song, "Shagging on the Boulevard," references many mainstays found throughout the area. The Bowery features live music each night, with current performances coming from the band The Bounty Hunters. If you love cold beer and country music, head over to The Bowery for a great time! 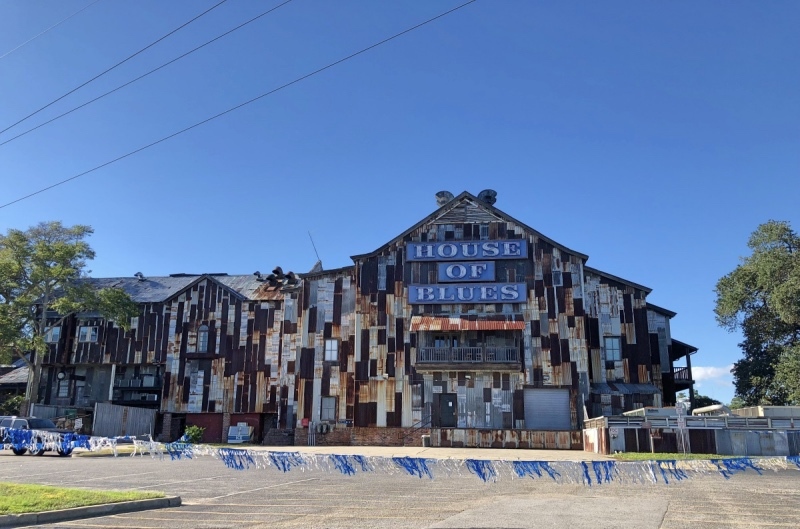 The House of Blues on the North end of the grand Strand hosts many popular music acts throughout the year, but even when headlining concerts aren't on the event calendar, there are still plenty of live music performances on schedule. HOB offers weekday Happy Hour events starting at 4pm, with live music generally starting between 5:30pm and 6pm. Sundays typically feature the World Famous Gospel Brunch in the morning and local artist showcase in the evening. Stay tuned to the venue's calendar of events to stay on top of schedule appearances from today's music superstars, as well as the tribute bands that cover them. You'll love the atmosphere and ambience at House of Blues! Pirate's Cove is one of the North end's top nightlife and live entertainment venues. Open 7 days a week, this bar and grill promises fresh-cooked food, ice-cold drinks, and the combination of a shag club, beach bar, and music venue, all rolled into one! With two stages of live music, Pirate's Cove features a set-up that is like no other venue along the Grand Strand. With two performance stages, expect the area's best live acts every day of the week throughout the Summer and consistently throughout the year as well. No matter what kind of music you prefer, they've got it all- from the most rockin' Rock, Reggae and Hip-Hop to laid-back acoustic jams, Beach music favorites and a variety of classic covers, there is something for every music lover at Pirate's Cove! Situated right in the back yard of the Intracoastal Waterway, The Boathouse has become one of the area's hottest gathering spots for food, drinks, and live music. During the Summer, The Boathouse hosts a Sunday Concert Series, featuring up-and-coming artists, local bands, and DJs in the outside area. Throughout the year, visitors can experience a variety of live music events, from Friday night live entertainment to pre-scheduled performances and tribute bands. Enjoy the view and great company whenever you take in the live music at The Boathouse in Myrtle Beach. No matter where you find yourself during your beach getaway along the Grand Strand, you're sure to be within close proximity to some of the hottest and most exciting live music venues in town. Let us know which one you enjoy the most!